Conversational intelligence changes the climate. Daily headlines suggest we are becoming mired in distrust, at high cost to our organizations. As our trust bank accounts are depleted, we run out of currency to invest in the future. And trust is not a currency we can easily print to offset the deficit. Sadly, it seems that distrust is settling over our cities. Bill O'Reilly opines: "There has been a drastic climate change in America, but it has nothing to do with the temperature. There is a climate of distrust in our leaders." Last year's headlines were filled with tales of dysfunction, discord and distrust, providing multiple confirmations that our organizations aren't working well, notes Adam Geller, a New York-based national writer. More than 85 percent of Americans surveyed by the Harris Poll said the people running the country are indifferent, up 50 percent from 2010. And an AP-GfK Poll found that two-thirds of Americans expressed mistrust of one another, continuing a four-decade slide. The information society buffets us with examples of institutional dysfunction, said Sheila Suess Kennedy, author of Distrust, American Style (Prometheus Books, April 21, 2009). Pope Francis acknowledged misdeeds in the Catholic Church and began to reform the scandalized Vatican bank and the church's tangled bureaucracy. Capitalism itself is broken, he said, warning against a culture that fosters "the globalization of indifference." Sadly, many individuals, teams, and organizations operate in a perpetual state of distrust and fear. Consider this: a door guards the entrance to our inner self. When we feel trust, we readily open that door, leading to an open exchange with someone else. When we distrust someone, thinking that he or she is somehow a threat, we slam our door quickly and begin to defend ourselves. The downside of such snap decisions is misinterpreting the signals from our bosses and co-workers, leading us to mislabel friends as foes. Or, perhaps we have trusted someone, only to get stabbed in the back. We might even be sending out signals of our own, causing others to distrust us even when we have their best interests at heart. 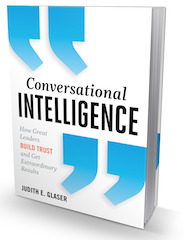 Conversational Intelligence is our hardwired ability for understanding how to create trust. While it may take many steps over time to restore lost trust, we can start by taking the five steps outlined in my TRUST Model. Step 1: Transparency. Be open and transparent about what's on your mind. Transparency quells the primitive brain, which reacts to fear, threat, and loss. But when we create conditions favorable for trust, people begin to talk openly about their fears. Transparency is also about sharing our intentions so people don't misinterpret them. Communicate openly with others to quell threats. Send messages of trust that the amygdala understands: "I trust you will not harm me." Step 2: Relationship. Extend the olive branch, even with foes. Extending trust sends messages of friendship to the brain that shift the energy toward appreciation. We know from researchers at the HeartMath Institute that focusing positive energy toward a person (Heart Appreciation) shifts our attention to seek connectivity, reduces the fear of power-over energy, and builds power-with connectivity. This feeling is then understood by others. The heart brain is activated and we sense positive signals of friendship. Partnering Conversations shifts relationships from judgment to respect and enables people to collaborate productively. When we feel respected and appreciated, the mirror neurons located below the prefrontal cortex activate, enabling us to identify and empathize with others. We stimulate our ability for bonding and collaborating, meaning that levels of oxytocin are increasing. This influx of neurochemicals reinforces trust. Step 3: Understanding. We learn people's thoughts by understanding their needs and emotions. Understanding their perspective, we can honor them. I believe understanding means we "stand under" the same view of the world. People trust us when they believe we have their best interest at heart. Seek to understand their perspective by listening, without judgment, and connect to their reality. Step 4: Shared Success. Create a vision of shared success with others. With a common view of success, we intuitively trust that others' decisions will be similar to ours, and that conflicts will work out fairly. Our neocortex functions to help us shape strategies for success. However, when we are attached to being right, we reveal an agenda. Such entrenchment leads to distrust. Trying to persuade others to want our success only creates resistance. Step 5: Testing assumptions and telling the truth. Test perceptions and assumptions about reality. Close the gaps between what you expect and what you get. When truth is discovered together, one shared view of the world emerges. Engage the prefrontal cortex--the executive brain--by shaping conversations that show you the world from another's perspective. Only then can you can see the bigger picture. You're not attached to being right and finding fault. Truth-telling starts with being able to see the truth about your own behavior. We are designed for connection with others, but when trust is broken we recoil. Conversational Intelligence shows that because we are designed to be social, our brains are sensitive to the signals of trust and distrust. When you use the TRUST Model effectively, you send signals of trust to others, that they will pick up on as you openly engage. You activate the trust networks in your own brain, located in the prefrontal cortex, strengthening your capacity to connect with others in healthy and supportive ways. By listening to connect, and by learning to see the world from another's perspective, you can attain the highest level of relationship with others. You will connect with people differently--and your conversations will reflect this new and powerful insight.